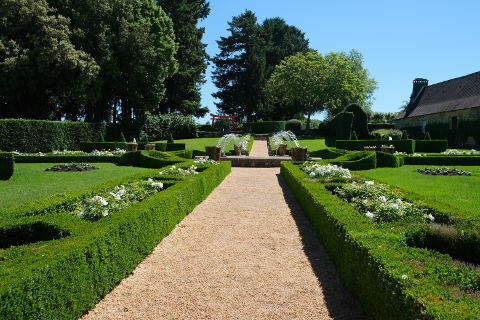 Les Jardins du Manoir d'Eyrignac are a few kilometers north of Sarlat in the Dordogne department of South West France. This garden is almost entirely made up of topiaries, with huge hedges cut into intricate geometric patterns and pots full of clipped box. It is a green oasis, particularly in the summer in the otherwise often parched south west of France. The Manor house and associated buildings built of golden coloured stone and with the deep sloping roofs typical of the area provide a beautiful setting for the gardens. There are five main parts to the garden; the Plant Sculptures Kingdom, the Box Labyrinth; the Manor and French garden; Capucine's gardens and the White Garden and Flower Meadow. There is also a vegetable garden. Topiary is a common feature of all of these gardens except for the recently added flower meadow. However the topiary ranges from low and simple hedges formed into knot gardens and filled with white roses and other white flowers in the White garden to the tall shaped hedges of Hornbeam Alley in the Plant Sculptures Kingdom. Whilst not my cup of tea for my own garden where I love to see lots of herbaceous plants, it is really well worth at least one visit and it is bound to inspire a longing for at least one or two topiaries in your own garden. 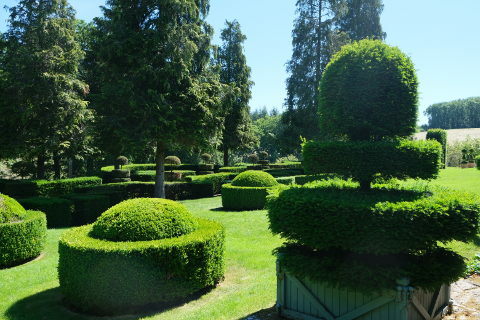 The garden was started in the 1960s and the topiaries are generally of box, holly and cypres. The gardens of Eyrignac are in the Dordogne department north of Sarlat. Every Monday night in the summer the White Garden are open for an evening visit and everyone is invited to bring a picnic and dress in white. The admission price is 16 euros for adults and includes admission, a welcome cocktail and music is provided for the evening. From the pictures we have seen it looks like a very stylish event. If you are a topiary fan don't miss a visit to the Marqueyssac gardens where the topiary is cut into beautiful swirling shapes and a lovely woodland walk looks down over the Dordogne river. 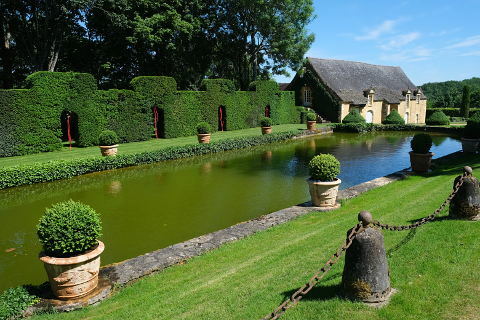 A little closer are the lovely gardens of Cadiot and the water gardens of Carsac.